I’m currently facilitating a Social and Collaborative Learning Essentials (SCLE) course. This course is offered through the Australian Institute of Training and Development. It runs in a virtual environment over eight weeks. This week I’ve refreshed the curated content used in the course. One person whose work I always check on when I’m refreshing this course is Julian Stodd*. 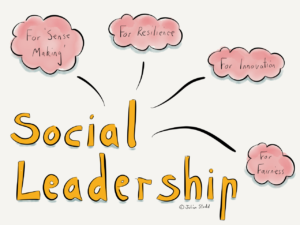 I find Julian Stodd’s research, thinking and practice around Social Leadership both insightful and practical. I also appreciate his philosophy that all his work is imperfect and is continually evolving. The group studied use 17 different technologies to interact on a daily basis, of which 16 are not controlled by the NHS – they are ‘shadow IT.’ If organisations want to leverage the power of social learning they need to move beyond an environment of control. This includes controlling the technologies being used to enable conversation and community. If you do an internet search on the term ‘shadow IT’ you will find a lot of articles talking about how the IT department can regain control of the tools and platforms being used. This is not especially useful to people in the organisation who are turning to tools that help them to get the job done, improve productivity and cut through red tape. While acknowledging the valid concerns that shadow-IT raises (just Google it) I find this a much more positive and useful perspective. Shadow IT is here to stay. People are finding value in using all sorts of consumer tools and platforms, as evidenced in the social learning sphere by Julian’s research. If we are going to support people to engage in high value conversations let’s shine a light in the shadows (but not too brightly lest we kill the conversation) and embrace shadow-IT. * Confession – I have a social learning crush on Julian Stodd. Just look at the language he uses to talk about social interaction – ‘choreography of engagement’ is a beautiful phrase. This entry was posted on October 5, 2018, 4:49 pm and is filed under Social Learning, Tools. You can follow any responses to this entry through RSS 2.0. You can leave a response, or trackback from your own site.